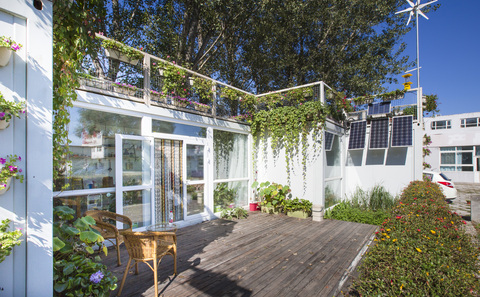 Niu had the containers made to order, with doors and windows, a power supply and insulation. 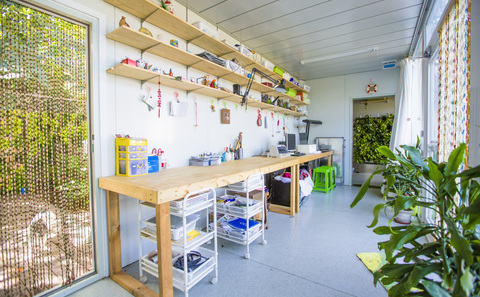 The 150 square metre-space cost him about 300,000 yuan to have built and fitted out and he describes this as a laboratory for sustainable living. 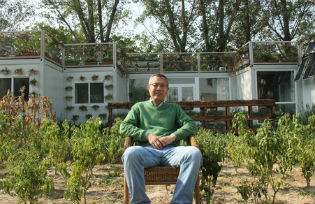 Asked why he wanted to spend so much money for a tougher life on the outskirts of Beijing, Niu explains that he wants to spread the idea of a ‘shared community’ – people who want to find a more sustainable life in the smog ridden city. 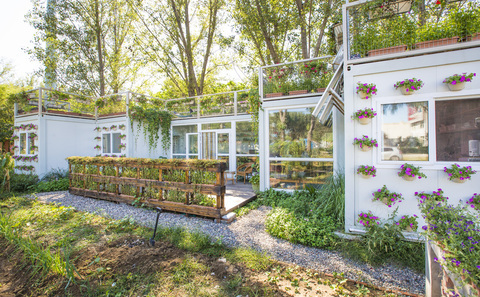 Niu and his family personally installed pipes and LED grow-lights for plants in the kitchen: “Lately we’ve been eating vegetables we grow ourselves.” Planters full of vegetables are growing rich and lush under the pale red light, a vertical garden which provides their food, along with the garden of organic crops on the roof. There are four such buckets in the bathroom. Grey water is used for flushing the toilet, and rainwater is collected for irrigation. Two others are connected to equipment for producing methane gas from treated sewage and kitchen waste. The gas is then used for cooking, while the solid and liquid residues left behind are used to fertilise the vegetables. The solar panels and turbine provide power for the LED grow-lights. After brewing a pot of tea, Niu continues his tale: “Humanity is right to pursue a better life, but they’ve taken the wrong route.” He says urban residents today face many problems: separation from nature, long commutes, congestion, pollution, lack of trust and poor sense of community. They urgently need change, but feel helpless. 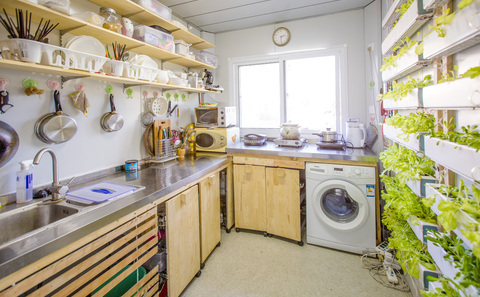 The container home is only the first part of his plan. It is a temporary installation to educate the public and will be removed in two years. In 2016, he plans to build a ten-household, 1000-square-metre multi-storey laboratory – though this may expand to 15 households. In 2017 he hopes to see a 10,000 square metre multi-storey residence to accommodate 100 households, with units to be sold or rented out. Liu describes this as a bold experiment for China, but because of limited funds the technologies used aren’t ideal. But, he added, the real problem isn’t technology – it’s bringing people with a common aim to live together.